Two or three days a week when I am picking up my very boring lunch in the company provided “cafe” I hear people asking for chives on their baked potato while pointing to scallions. There is a distinct difference between scallions, green onions and chives. A scallion should not have a white bulb on the bottom but will usually have a white portion towards the bottom. A green onion has a small white bulb on the bottom and is a young onion. A chive is an herb and the smallest edible member of Allium schoenoprasum. All three are members of the Allium family with each offering different tastes. Chives offer a very delicate flavor and when cut look like tiny beautiful green bugle beads. Not to downplay green onions and scallions but chives will always be my favorite. 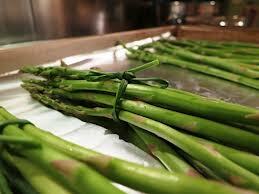 You can even tie asparagus bundles with them for a beautiful presentation. We could go on from here to cover other members of the onion family up to and including garlic chives but really I just needed a moment to clarify the difference because I am craving the perfect scrambled eggs with smoked Gouda and chives.